Season steaks with salt, pepper and herb de Provence. Grill over direct heat to medium-rare, or to an internal temperature of 130°. Transfer steaks to cutting board and let rest for 5 minutes. 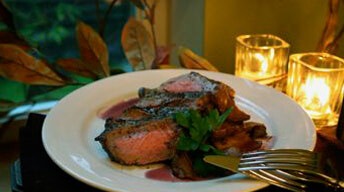 Slice steaks and transfer to platter; top with Cabernet Pan Sauce. Place sauce pot over medium-high heat; drizzle in olive oil. Stir in garlic and shallot; saute until soft. Increase heat to high and deglaze with cabernet; reduce to glaze and pour in stock. Continue to cook until reduced by half; whisk in butter and season to taste with salt, pepper and rosemary.